​As we all know, every dog that has long hair should have a proper grooming. With the proper grooming, these dogs will definitely develop a nice and healthy hair that they deserve. However, the whole process of grooming a dog’s hair can be really hard and frustrating for so many reasons, especially if you are dealing with the GoldenDoodle. Luckily, we are here to discuss everything that you need to know in order to learn how to groom a goldendoodle. In that light, let’s start with the whole process. We will divide the whole process into three different sections so that you can groom your goldendoodle in the best possible way. ​Now, let’s see everything that you need to know in order to learn everything about how to groom a goldendoodle at home. Let’s begin. As a dog owner, you should know that brushing your dog’s hair is essential for keeping a good and healthy hair in general. Now, you should brush your dog’s hair at least three times a week, sometimes even four times, especially when it comes to goldendoodle. That is more than enough times for grooming if you wondered how often to groom a goldendoodle. Also, a regular brushing of the goldendoodle’s hair will keep its hair clean and mat free, which will definitely provide a good looks and healthy hair in general. However, if you in any case find small mats inside your dog’s hair, you should probably need to cut them off. Since small mats are quite hard to brush, it is recommendable to cut them off and prevent them from getting larger and causing a problem for your dog. Now, let’ see how to brush your goldendoodle’s hair. First of all, you should definitely use Sticker Brush for this kind of job. Namely, a Sticker Brush is a convenient and pretty helpful tool when it comes to brushing your goldendoodle. This brush is equipped with hard and durable bristles that will straighten the hair of your dog in no time. However, you might come across some mats that this tool is not able to brush. In that light, you need to find a different kind of brushing tool in order to learn how to groom a goldendoodle the right way yourself. Next, you should start from the back of your dog. Make slow and gentle movements with the hair towards the stomach of the dog. The whole point is to do it slowly until you see the skin of your dog. This will definitely be enough when it comes to brushing your dog’s hair. It is also quite important not to skip any part of your dog’s body when brushing its hair. Simply speaking, you should start from the back of the dog, and slowly advance to the stomach. Next, you should brush its neck and legs. This way, you will ensure that your dog’s body is brushed properly and that it will have a beautiful and nice hair. Also, don’t forget the armpits and the tail. These areas are quite hard to brush, especially when it comes to goldendoodle dog. Now, if you come across any mat in your dog’s hair, you should definitely use a little bit different tool than the brush. Namely, you should use grooming scissors or even the dog clippers in order to remove mats. After you successfully remove the mat in your dog’s hair, you should finish brushing with the sticker brush. The matting problem occurs a lot, no matter the goldendoodle coat types. Anyhow, goldendoodle grooming should be pretty helpful and convenient for preventing mats. Possibly the most important thing about grooming your dog’s hair is to bath it from time to time. Your dog’s hair will be healthier and definitely will look better if you bath your dog after some time. Now, the important thing to know here are the tips that could really help you to bath your goldendoodle in the best possible way. Tip 1: Don’t bath the puppy of the goldendoodle until the week has passed from the time you bring it home. This way, your puppy will not endure any unneeded stress and your new family member will be happy and safe. This actually is the best way to learn how to groom a goldendoodle puppy. Tip 2: Make sure to bath your dog in the right environment. By the right environment, we mean that you find nice and warm place without any sign of drafts. Turn your AC off or any cooling system that you have, you don’t want your dog to get chills. Tip 3: The preparation process is also important. You should prepare your dog for the bathing time. Make sure to have a bag of treats near you, since bathing can be a little bit stressful for the dog and the best way to relieve your dog from stress is to give him a nice snack. Tip 4: Use only warm water that you would want to bath yourself with. Also, get some good dog shampoo. After you dried your goldendoodle completely, you should start with the combing and trimming if it is necessary. Simply speaking, you should go with the head first, since that is a proper way on how to groom a goldendoodle face. Also, when it comes to coming and trimming, you should practice different grooming goldendoodle styles. We suggest that you stick to the basics for now, and after a few grooming sessions, you can start with the styles. This will prevent any goldendoodle shedding, and your golden doodle ​puppy will be healthy and cheerful for the time being. Besides that, you should also see how to groom a goldendoodle eyes. 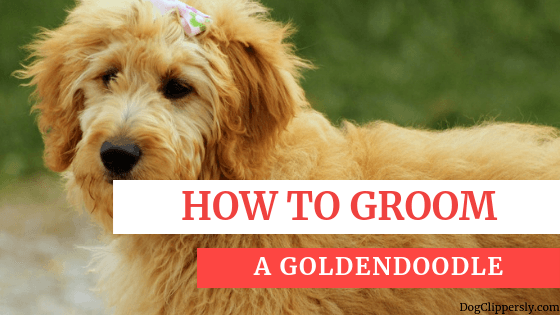 In the light of everything we said above, grooming of the goldendoodle is definitely important since you probably don’t want to know how much does it cost to groom a goldendoodle. It really doesn’t matter what is the goldendoodle size, you should groom your dog no matter what. Also, it is important to learn how often to groom a goldendoodle, but that answer you should get from a vet. All in all, you need to be a responsible goldendoodle owner and provide your dog with the best possible care no matter what.